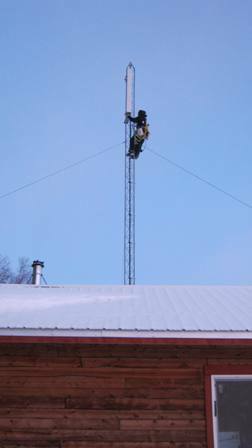 After weeks of delays due to the extended deep cold our region experienced this winter, the weather moderated and GCI technicians were able to install cell service in Napaimute on February 21st. This system is the first of its kind in our region. The cell signal comes in through the small GCI dish we already have for our regular phones and Internet. The cell signal is then broadcast through a special antennae from the tower we put up two years ago. At this time, the range is limited to the original village site as far down as the airport, upstream to Avakumoff’s fish camp, and the foothills south of the River, but we are very thankful for this service. It is very nice to be able to make and recieve calls from right in your own house or from any of the Tribe’s buildings.